Friday June 23 1911 Did churning bread-baking and put up some cherries. I went down home at 7.15. other was down at Otts in her wheel chair. Blanche & Little Robert came tonight. We thought Mothers toe a little better tonight. Saturday June 26 1911 I did not come home till 6.30. We got up three quarts more of cherries. Will to town in afternoon and I asleep. Spent the evening on the porch. 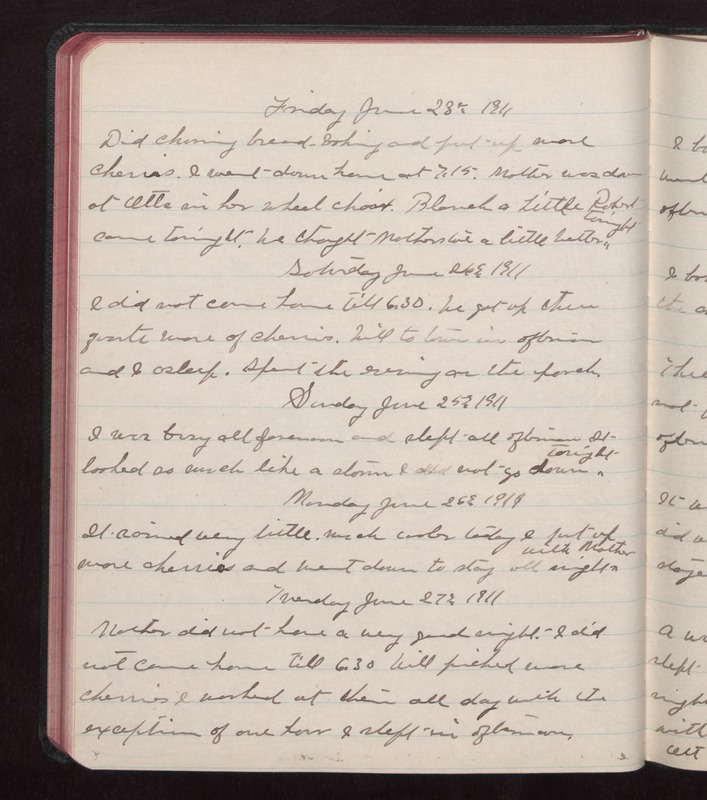 Sunday June 25 1911 I was busy all forenoon and slept all afternoon It looked so much like a storm I did not go down tonight. Monday June 26 1911 It rained very little. Much cooler today I put up more cherries and went down to stay all night with Mother Tuesday June 27 1911 Mother did not have a very good night. I did not come home till 6.30. Will picked more cherries I worked at them all day with the exception of one hour I slept in afternoon.